If there is one thing the Big Ten has plenty of, it is trophy games. The conference is home to 12 trophy games and that number could be on the rise as two new members join the conference starting tomorrow (July 1). Maryland and Rutgers will join the Big Ten, which should lead to some new rivalries within the conference over the course of time. Both new Big Ten members will have a close regional rival with Penn State, and the two will likely develop a rivalry between each other as well. Maryland is already getting in the Big Ten flavor by discussing the possible addition of new trophy games with its new regional rivals from Rutgers and Penn State. The Washington Post says a handful of athletic department officials at Maryland have confirmed that to be the case, although the details of those potential trophies are far from being anything worth sharing. Maryland and Rutgers have zero trophy games, but Penn State has two with Big Ten foes. The Governor’s Victory Bell is awarded to the winner of the Penn State-Minnesota games (last year Minnesota players broke the flimsy trophy), and the Land Grant Trophy is awarded to the winner of any game between Penn State and Michigan State (it is also one of the ugliest trophies in college football). Penn State and Michigan State have not faced each other since 2010, before the Big Ten created divisions with the addition of Nebraska. The two will now be in the same division, so the Land Grant Trophy will again be making an annual appearance. 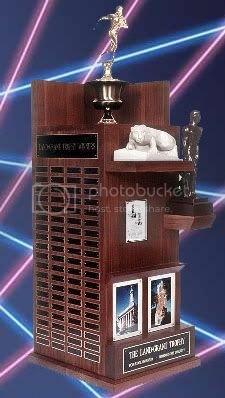 What would be a good concept for a trophy between Penn State and Maryland? Perhaps something relating to the Mason-Dixon Line? What about Maryland and Rutgers? Perhaps a three-way trophy could be started up for the winner of the Maryland-Penn State-Rutgers match-ups as well, along the lines of the Commander-In-Chief’s Trophy for Air Force, Army and Navy? If anything, I would like to formally propose if Maryland beats Ohio State and Illinois in the same season, then the Terps gain control of the Illibuck until either team defeats them.